Hello my lovely followers, I know that many are busy with the hustle and bustle of the holiday season, but I do hope you’re still able to carve out some time to make pretty things and keep that creativity flowing. 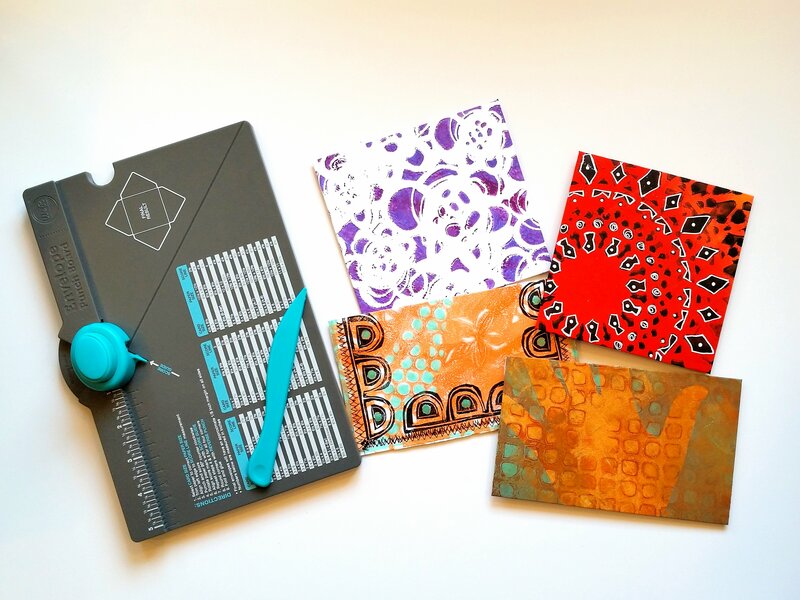 Today I’d like to share with you a fast and easy way to transform some of your yummy gelli prints into cute stitched booklets that are just the right size to tuck into your bag. Use them for jotting down to-do lists, grocery lists, as stocking stuffers or create a few to carry around for doodling. The November Stencil Club stencil from Stencil girl was used to create this gelli print. To create these, I used a paper trimmer, plain white printer paper, a few gelli prints that I had in my stash and my sewing machine. Since my paper and gelli prints are the same size, I just cut them in half. 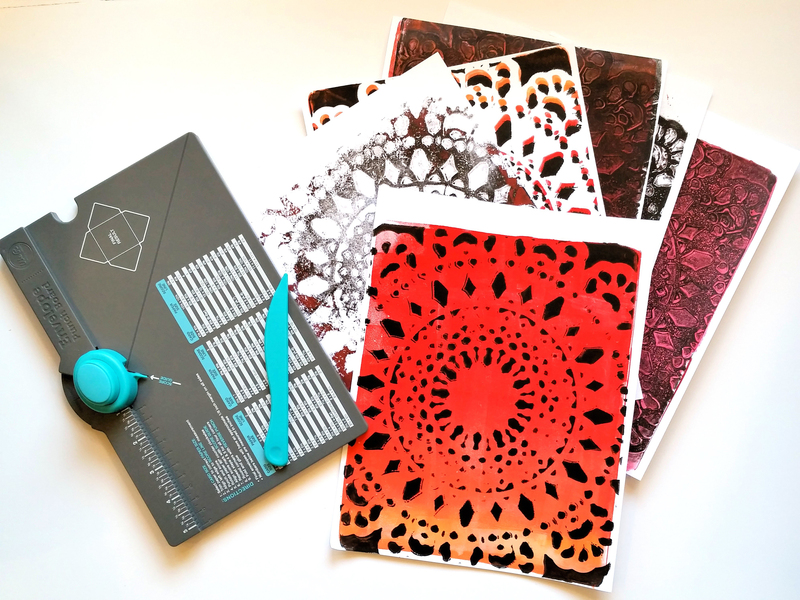 One print will create 2 books for me, but you can cut and size your gelli prints and paper to you liking. One thing I’d like to point out here is that not all sewing machines or needles are created equal. Some machines can handle a thick stack of paper, others can’t. I recommend that you play around with yours and see what works. My booklets contain 8 pages plus the cover. Once your paper and cover are aligned and you’ve given it a light score, you’re ready to stitch. Use whichever machine settings you feel comfortable with and stitch right down the center, using the score line as a guide. Don’t worry if your stitching isn’t straight. Wonky stitching can give your project great character. Trim your thread, close your booklet and run your bone folder along the spine to help define the fold. 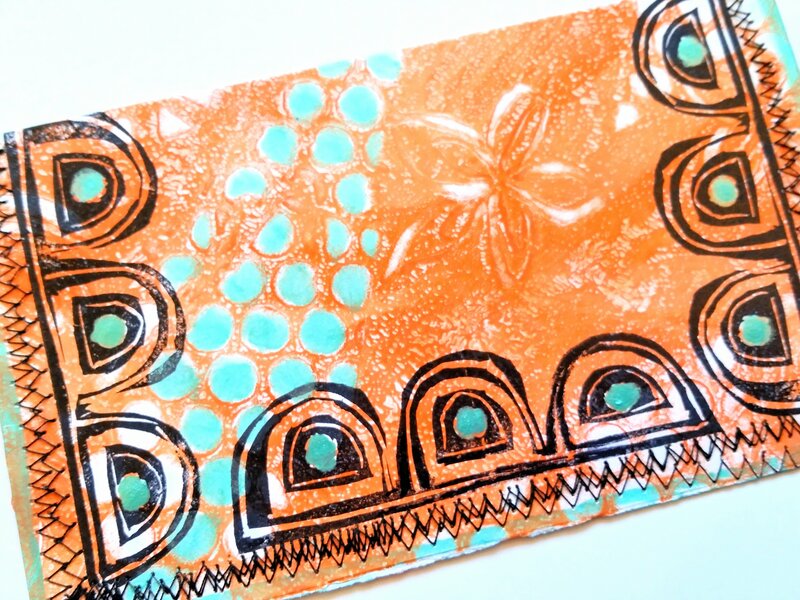 At this point, you can prettify it even further by adding a little stamping, doodling, more stitching or just leave it as is and let the gelli print shine. I stamped some lettering to the front cover of this one and added some wonky stitching. 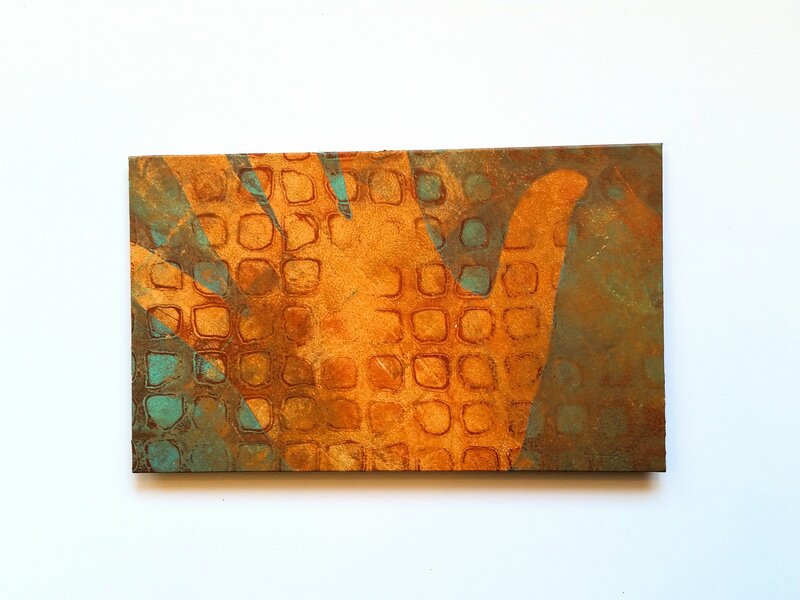 Something else I’d like to point out is that you don’t have to limit yourself to just using gelli prints. These can just as easily be created using scrapbook paper, envelopes, even your “under paper”. This booklet shown here was created from a happy mail envelope that I received from my good friend and talented artist, Jana Freeman. There was no additional stamping or doodling done by me. It was gorgeous as is and I wanted her art to shine. You’ll notice that my stitching bunched up at the top and created a tangle. Well I decided that I rather liked the character that the tangled thread gave the booklet, so I left it. That’s the great part of these little books, you can really make them your own; there are no rules. If your machine can do the job, you can stitch it. If it can’t, you can stitch it by hand. Make big ones or small ones, create them in whichever way is pleasing to you, just have fun! I love mail art happy mail! It’s a beautiful thing to open up your mailbox and find, in a sea of bills and junk mail, a gorgeous work of art sent in the spirit of kindness and generosity. The thing is, as much as I enjoy sending it, I don’t always have a lot of time. However, late last night inspiration struck as I was pulling prints off my gelli plate! 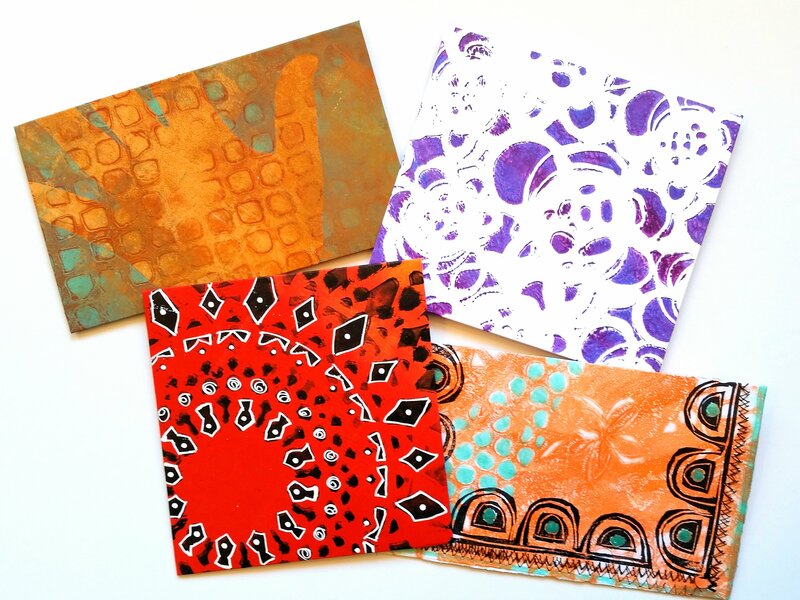 If you’re like me, you have gelli prints piling up faster than you know what to do with them, because once you get started… well you know how it is! That being said, I’m always on the lookout for fun and different ways to use my prints. 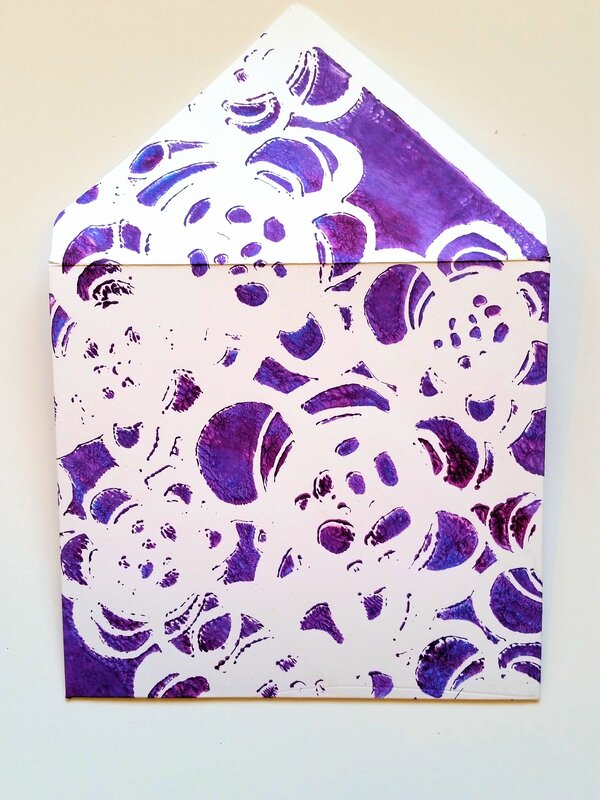 So last night I grabbed my envelope punch board from We R Memory Keepers, a few gelli prints and cranked out some mail art envelopes in literally just a few minutes. If you want to add additional elements to your envelopes you can, but you certainly don’t have to. 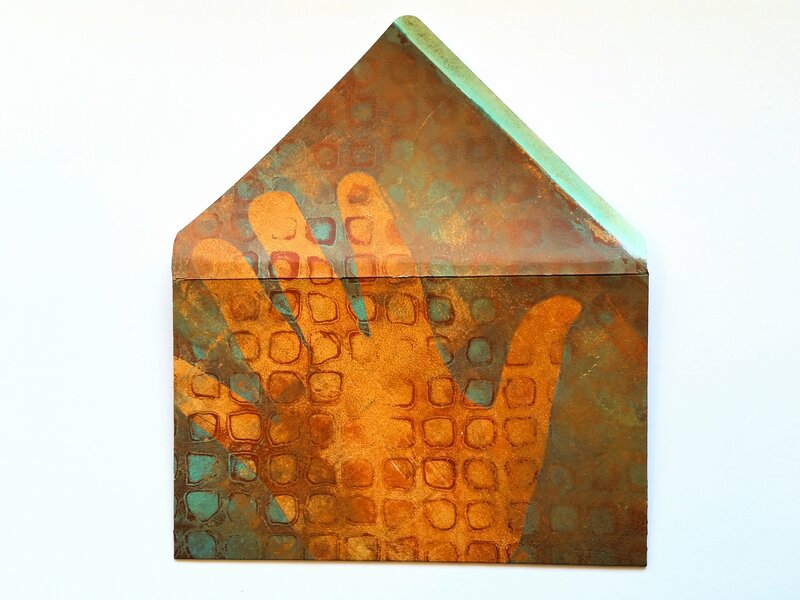 This is an envelope that I created from a leftover print I pulled for last week’s DLP challenge, “trace a hand”. Here’s another one made using a print that I pulled a while back using a stencil from Traci Bautista, again no additional stamping, painting or doodling; it’s ready to go as is. If you have more time and want to jazz up your envelopes even further, you can. 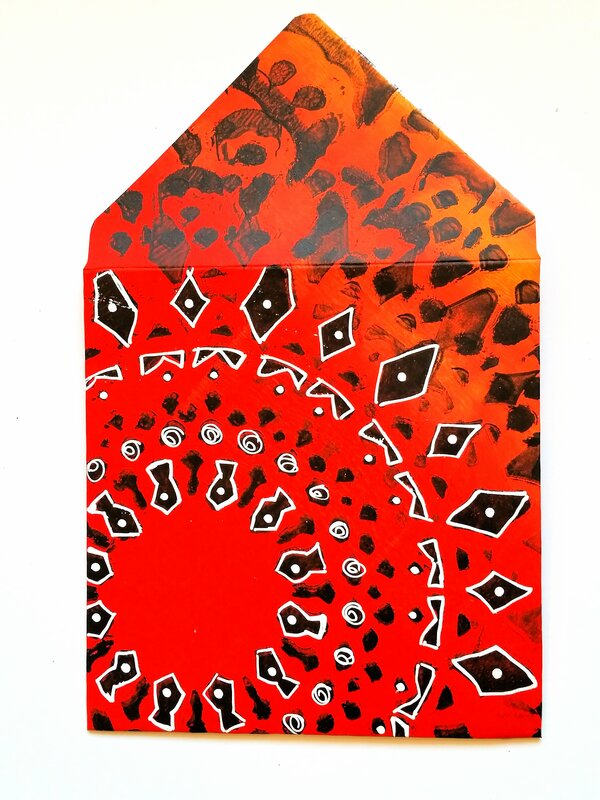 These 2 envelopes were made from prints using stencils from KaiserCraft (red envelope) and a Traci Bautista (orange envelope). On both of these I added additional elements. A few doodles, some stamping using my own hand carved stamps, and even some wonky stitching. I’m so excited, I don’t know why I didn’t think of this sooner! I’ll definitely be able to get more mail art out now AND keep my stock pile of gelli prints down to manageable levels. I got my envelope punch board from Amazon, details HERE, but if you don’t have one, you can find an envelope template online and cut your own. Thanks for reading, hope you enjoyed the post. Wishing all my lovely followers a fantastic, art filled week!